Our Customer Success team's goal is to assist you in the best way we can, and that does not include phone support at this time. You can reach out to us using the chat bubble and a member of our team will answer you right away! By using chat support over phone support, our Customer Success team can more easily contextualize what's going on much faster. We're able to see where you are on the site and what you're working on, allowing us to more easily and quickly pinpoint the problem, and then solve it using videos and annotated images to get you exactly what you need in real-time. How can I get in touch with GiveGab? We love chatting with our nonprofits. Just send us a quick message - even a "Hi, I need help!" will do 😊 Just click on that blue chat bubble in the bottom right hand corner and say hi! 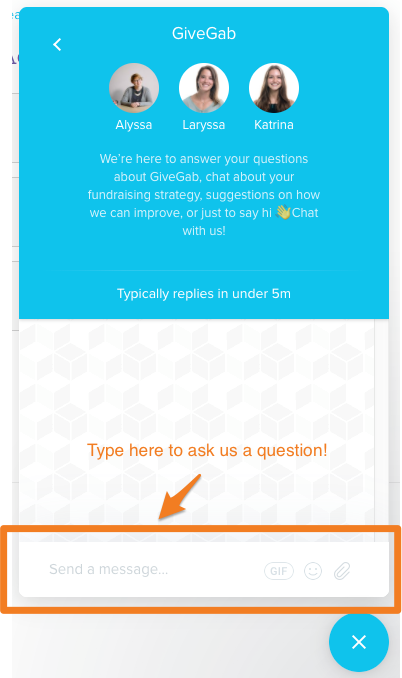 By using chat, we're able to see exactly where you are on GiveGab and can assist you even faster with screenshots and videos!